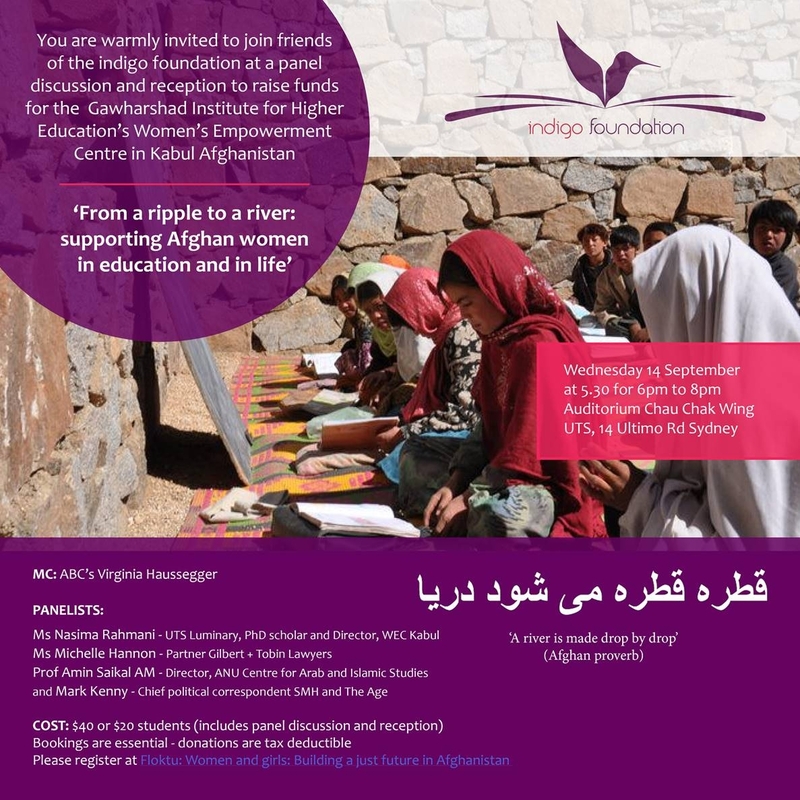 Please join us for a thought-provoking and inspiring panel discussion: 'From a ripple to a river - supporting Afghan women in education and in life'. In the face of ongoing instability in Afghanistan, the panel, chaired by the ABC's Virginia Haussegger, will look at the contributions and struggles of women in Afghanistan today and the barriers and opportunities for Afghan women to build a just and peaceful future for their country. Many thanks to the UTS Faculty of Law and UTS Alumni for hosting the event. Funds raised from this event will go towards indigo foundation's partnership with the Women's Empowerment Centre at the Gawarshad Institute of Higher Education in Kabul and the Afghan Educated Women's Services Organisation. These funds are needed to continue supporting Afghan women to study at tertiary level and to build their capacity to change their world. Bookngs are helpful for catering purposes but tickets will also be available on the door.